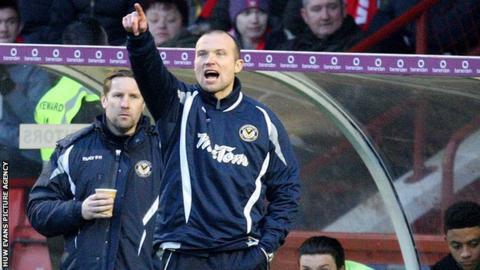 Newport County manager Warren Feeney says he wants to keep changes to a minimum after replacing John Sheridan. Ex-Northern Ireland striker Feeney was confirmed as County boss following Sheridan's departure to Oldham Athletic. Aaron Collins' early goal secured a 1-0 win at League Two's bottom side York City in Feeney's first game in charge. "I don't want to change a lot of things because John left a fantastic morale," Feeney said. "He lifted them from where they were and I just thought I wasn't going to change too much, just tweak here and there. "John's gone and we've got to move forward." Newport were bottom of League Two when Sheridan was appointed as Terry Butcher's successor in October 2015. The former Republic of Ireland international transformed the club's fortunes before returning to Oldham for a second spell as manager. Sheridan's assistant Feeney is County's fifth manager in less than 12 months and the win at York puts them six points clear of the League Two relegation zone. County take a break from league action as they face Blackburn Rovers in a re-arranged FA Cup third round tie on Monday, and Feeney says it will be a welcome distraction. "It's a free game and a challenge against a team in the Championship," Feeney added. "I want to win the game but the league is my priority because we've got another massive one on Saturday. "I've told the players to go and enjoy it and I look forward to a fantastic game."